WOW! Woo HOO! I can’t WAIT!!! 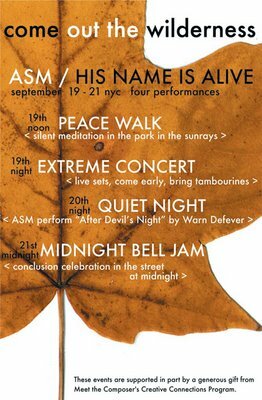 Anti-Social Music and His Name is Alive join forces for a three-day four-event residency in New York City called COME OUT THE WILDERNESS, starting with a peaceful prayer meditation in a park, ending with a midnight bell jam in the street and with shows at Mercury Lounge and Tonic in between. Help celebrate INTERNATIONAL PEACE WEEK with punk-chamber music group Anti-Social Music (ASM), and Detroit based band His Name Is Alive (HNIA) who will provide everything from earth-toned outdoor folk music to mountains of extreme sunshine jams. COME OUT THE WILDERNESS is a performance based piece and a three day celebration of peace, nature, wolves, chamber music, and magical vibrations!!! In 1972, when I was three years old, my mother gave birth to twin boys. Several monthes later during a Labor Day vacation, my family was visiting relatives in the Upper Pennisula of Michigan, and one of the twins, Michael, was attacked and killed by a wolf, commonly found in the northern region of the state. His brother, Matthew, survived somehow. Upon arriving back in the Detroit area and shortly following the funeral, my parents changed my middle name to Michael, as a sort of memorial. This experience is one of my earliest memories. In 2002, I attended a “peace walk” led by Thich Nhat Hanh, a gentle monk from Vietnam whose vaguely Buddhist writings teach that world peace can only be brought about through individual internal transformation. The deceptively simplistic nature of this act profoundly affected my life. 1. A peace walk is a form of non-violent protest in which protesters march a distance, often to raise money for a charity. 2. HIS NAME IS ALIVE are a difficult band to categorize. Their sound is constantly evolving. Their sound is consistently unique. They made their name with expressionistic experiments for the 4ad label. Later music is guided by more graceful concerns. 4. COME OUT THE WILDERNESS is not a “staged” event, it is participatory and requires very few materials. Margaritas to go!!! Bring a bell!!! COME OUT THE WILDERNESS is supported in part by Meet the Composer’s Creative Connections Program, NYSCA, and the Meet the Composer JPMorganChase Fund for Small Ensembles. Um, Troy-baby? TNH is 100% Buddhist. Of the Vietnamese school, but dere ain’t nuttin “vaguely” Buddhist about it! Come have a drinky poo with me. I think he may have been referencing the manner in which Thich presents some of his writings, because some of the books seem to be written as inspired by Buddhism and very kind to the laymen or noo-b. Depending on the book referenced, I can see why it’d be described as “vaguely.” On the other hand, he may have been being tongue-in-cheek, indicating the books that are dripping with Buddhism? I dunno… just guessin’.